Welcome to my first post of 2012. I assume we have a crop of new readers and people who have vowed that this is the year they’ll get organized. Welcome, I say! If you’re new here, I highly recommend that you read Colleen’s guidelines for decluttering. Typically I write a long post, but today I just want to give you hope on your decluttering journey. No matter what your circumstances, no matter who you live with, no matter how many children or pets or elderly parents you have, you can declutter a thing a day, one day at a time. In 2011, I decluttered 1888 things, and I made $1126.75 plus another $1000 I bartered in repairs for my van when we decluttered (and did not replace) my husband’s car. As you can see, the benefits of decluttering are many. For inspiration, I present to you photos of my daugther’s room. These first photos are just about as horrible as anything you can imagine, right? They were taken in September 2009, just before I hired a professional organizer for 3 hours to help me tackle the room. These second photos were taken on December 26, 2011. I did nothing to prepare her room for the photos; this is how I found it. To read more about the process of getting her room from chaos to control, you can read my post about it here. But, as you can seeing if you compare the “after” photos there to the “after” photos here, she has cleaned and decluttered her room even further in the subsequent 27 months. My daughter is only 9 years old. If she can do it, you can too! 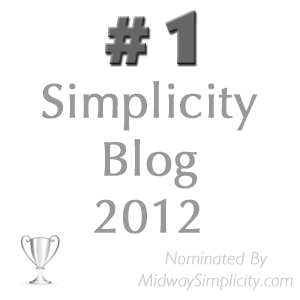 Here’s to our continued decluttering success in 2012! Since I no longer have a Christmas tree I won’t need a skirt for it. This declutter wasn’t as easy as you might think though. 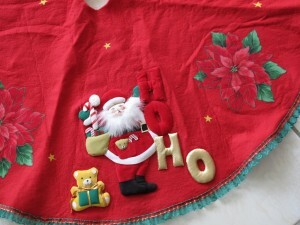 My mother made this tree skirt for me some years back so there was a little sentimental attachment. When I really thought about it, it was more of a guilt feeling of decluttering something that my mother put effort into making for me. Guilt isn’t a good reason to keep something as I am sure my mother would agree so I donated it to the thrift store. All the new subscriber that have signed up recently. I hope that my blog will give them the advice and encouragement they need to met their decluttering goals. a happy new year to you too. 2012 will be my first minimalistic year. good I found such a great company in this blog. Thank you Lena. Audra has gone much further with her cleaning and decluttering than I could have imagined! Wow. Just wow. I so wish I could get the people in my life to go along with my need to declutter my home. My mother and father are moving to South Carolina this month and in the process, I have inherited several (many) items that she can’t move with her because their house is much smaller. I have taken all of them willingly and there was no guilt involved. However, now I have more than I started with! I know what I will be doing with the items I took for me (mostly quilts she made), but I took a few things for other members of the family and now know we don’t need them. The one that is sticking in my craw is the set of Ansel Adams prints I brought home for the frames. My husband said he wanted the prints in the frames for his office, but that was six months ago and he still has not hung them. They are taking up space in my cabinet in the family room and I want to just donate them. And I wonder if he would notice if they were gone? How on earth do you get your family members to understand that you don’t need so many things???? All of my children except my youngest have rooms that are filled with things they have outgrown, don’t use, no longer want, etc. They are packrats! The only thing I know that I do that is perhaps unique is talk about decluttering… a lot. I talk about the blog, what people say, I reflect out loud on what we have that we don’t need, what other people in the house might not need, point out that people have excess, etc. Audra mostly lacks sentimental attachment to her goods. Her sister probably acquires fewer things, but releasing them is harder for her. smart… slowly talking your family into decluttering is amazing. keep on going that way. I am making slow progress in my attempts to explain and maybe even convince people, but I try. I was stunned when you said you’d decluttered 1888 things. But then I started thinking about everything I’ve gotten rid of and if I’d counted each individual piece I’m sure it would be close to 1000. Just the fabric stash alone would be that, but I counted it as one item. I’m so shocked when I find another pocket of STUFF that needs to be gone through and weeded out. I feel like I’ve already purged so much there can’t possibly be more. But there always is. I do count everything or virtually everything. After a big paper clean up, I weighed the box of paper that needed to be shredded (13 pounds, as I recall), but I counted it as one. However, the other day Audra took 8 rocks of her shelf and threw them into the rock drainage area on the side of the house, and that counted as 8 items. What fantastic life skills your DD’s have learnt Cindy! Very impressive. I am a fan of professional declutters: I have mentioned before that I had one for my attic 3 yrs ago and it was money well spent: it has underpinned everything I have done this year. I remember that Katharine. I couldn’t have made forward progress a few times without their help, and Audra’s room was certainly one of those times. I was truly felt overwhelmed just looking at it. I can’t imagine needing one now, and I can’t imagine not needing one, at least occasionally, then. Great post. I love the before and after pictures. I just wrote something on getting the family on board before coming here to look at your website. Thanks for all your tips and ideas! Thanks. Colleen asked both of our husbands to write posts; we’ll see if either of them does it! Amazing transformation on the room. Thank you. Can you believe she decluttered the shelves further on 12/31? Amazing! My boss confessed the other day that he had 10K emails, so he has you beat, but I don’t think it’s a record either of you should strive toward. Electronic clutter is still clutter. Although it doesn’t take up room on the shelf, it can keep you from finding what you want when you want it. A friend pointed me in your direction today, and I’m glad she did!! Today we purged about 1/3 of our stuffed animal collection (my daughters are 2 and 4). Some of my childhood animals were hard to give up, so we had a photography session with those. My daughters saw that it was okay to document a toy with a photo and then it was easier to give away. They had a great time helping me sort, and they’ve insisted that the animals go to kids that don’t have any toys to play with. I’m good with that!! I can’t wait to declutter my house!! first please let me extend to you a very warm welcome to 365 Less Things and thank your friend for sending you here to us. Now let me say what a wonderful thing you did with your daughters. Teaching them to let go and to making that easier by letting them know that the toys were going to kids who didn’t have toys is a great way to raise kind, generous and well adjusted children. It is funny that you should share this story with us today because I had a pregnant mum surrounded with three little children come into the thrift store where I volunteer just this morning. They were donating a huge bag full of stuffed toys and the mum said that it had been a little difficult but she told the kids the toys were going to other children who didn’t have toys. I made sure I thanked the children and told them what a lovely thing they have done. I also told the mother that she was teaching the children a good lesson in life. So involve your children in any decluttering that relates to their stuff when you declutter the rest of the house, so they learn that things need to go when they are no longer necessary. It doesn’t hurt to hold onto a few special things though and never take things from them until they are ready to let go. I look forward to hearing more about your declutter journey so please keep in touch as often as you like. We are always here to listen, to help and to learn. Hi Tracibub, Welcome to 365 Less Things. A lot of people photograph hard to get rid of items. In my mind, that’s just exchanging one type of clutter for another (much smaller) clutter, but if it helps you or the children let go, then do it. I wonder if you even need to keep the photos or if the ceremony of photographing them, in and of itself, is sufficient. I for myself have last year parted with my amazing red boots. They have been in the closet for more than 5 years. I took pictures and then let them go. I put the picture as my desktop background. makes me smile. so yeah, more clutter but good one. maybe I will be able to delete it one day. The ‘guilt’ items are the ones I have the most trouble with parting with as well. 2012 is the year of no guilt though. I need to get rid of lots! I read somewhere that as long as you appreciate that the person went to the effort for you or gave you a gift then that’s all you need and you are free to pass it on. let me first extend to you a very warm welcome to 365 Less Things and thank you for dropping in to introduce yourself. That gult clutter can be really insidious stuff if you let it. I am sure we have lots of old post relating to this topic. If you go to the Tag Cloud located in the right margin of my blog pages and click on guilt trips or probably better still, type guilt clutter into the search box above the Tag Cloud and that will show you lots of post to peruse. And I agree with you that as long as you appreciate that the person went to the effort for you or gave you a gift then that’s all you need and you are free to pass it on. In fact it is better that the item is being truly appreciated than left to linger unused, uncared about or worse resented for taking up precious space. I have never had anyone ask what happened to such and such that they gave me and I would never do that to anyone else either. A gift should be given with no strings attached. So good luck with your decluttering and make sure to stay in touch with us and leave lots of comment so we know how you are getting on. Welcome! As Colleen wrote above, she’s written a lot about guilt clutter. Here’s to saying NO to guilt in 2012. Wow! I will have to show MY daughter, your daughters room. My DD is 21!!!! Her room is a slum, there is no other word for it! My de clutter journey continues slowly, piece by piece but I am definitely moving forward and my house is much more organised than it has ever been. Yesterday a friend came over with his little boy who was rather taken with my two Christmas snow globes, as they were made of plastic I was delighted to be able to offer them to him, one for himself and one for his sister. It was worth it for the look on his face 🙂 if all decluttering could be that pleasant my house would be bare! Isn’t it great when something we no longer want IS something someone else wants? I just moved, and didn’t want my IKEA bookshelf anymore, but hadn’t got around to freecycling it. Then yesterday I saw someone post a ‘wanted’ for the exact item I had (down to the model number), and she’s happily collecting it this weekend. YAY! Well done Snosie. I love it when a plan comes together without even having to try. That’s fantastic. I got rid of some of my Christmas decor to a neighbor who had an ugly divorce and, because of that, she forgot to retrieve anything out of the attic, so she had none of the holiday stuff we all seem to build up over the years. I was so pleased that one thing in particular was going to her. I like to know the yarn Santa is living on, just up the street. Good grief, Cindy, never mind your daughter – I’d be rapt if I could keep my rooms as tidy as that!! My house used to be pretty awful, no doubt about it. Now it takes almost no time to get it in ship shape. You CAN do it! I’m always amazed that I continue to declutter but still find so much more that needs to be evaluated 🙁 and I’m not a packrat.